Mark Twain wrote, “A man who carries a cat by the tail learns something he can learn in no other way.” Truer words have never been written. Ask any cat owner. Most cats prefer to keep their paws on the ground, but sometimes you must pick up a cat. Whether it’s to go to the vet or simply because you want to snuggle (see other ways to show your cat affection if your cat’s not the cuddly type). Picking up and holding a cat can be challenging, unless they are used to being picked up or enjoy being in your arms. It can also be stressful for both you and the cat, which can result in a bite or scratch. Guess who is on the receiving end of that? As with any interaction between a cat and a human, a lot depends on the personality of the cat and your relationship. Be patient with your cat and never force the cat to behave in ways that are stressful or uncomfortable. 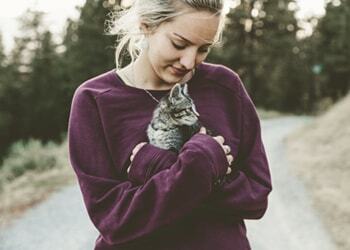 There are tips you can follow to make your cat more comfortable with being held, but some will be more resistant to your hugs than others. Be aware of your cat’s body language or facial expressions and what they’re saying. Always pick up your cat with both hands, no matter what size the cat is. Not only is it safer to use both hands, but it will be more comfortable for the cat. Never surprise the cat by grabbing them unexpectedly. Most cats don’t like surprises and if you do startle your cat, you may be the one in for a surprise. Provide support by placing your arms under the cat to support both the cat’s chest and back end. Of course, each cat is unique, but most cats do not like being cradled on their backs. Be aware that you should never attempt to pick up a cat by the scruff. Only small kittens should be picked up or carried by their mother this way. Grabbing older kittens and cats by the scruff is uncomfortable and can be harmful, even if you support their legs. Once you have picked up your cat, you may need to put her in a carrier for travel. Take your time and make sure your cat is comfortable with the carrier. Try giving your cat the opportunity to explore and adjust to the carrier without any trips involved. Always be aware of your cat’s mood. If you see that your cat is angry or stressed when you bring out the carrier, try to sooth and calm your cat before putting them inside the carrier. With time and patience, most cats become comfortable with being picked up, held and transported in a carrier. Some kitties will always struggle and may need extra care and caution. In these cases, positive reinforcement pet training may be useful. Remember that there are only two ways to pick up a cat: the wrong way and the cat’s way.